The AdMaS Center succeeded in CAMEB in October 2018, part of the programme to support applied research, experimental development and innovation of the National Competence Center, which aims to promote long-term collaboration between the research and application sphere and to strengthen the institutional base of applied research. The motivation for the creation of the CAMEB center is the decline, resp. the reduction of non-renewable natural resources, both material and energy, and the impact of this phenomenon on construction. The current trend of massive energy savings in building operations brings significant improvements in operating energy, but the material and energy intensity of construction is so steep. CAMEB therefore associates partners with such competencies that will enable better use of resources in the construction industry in the spirit of circular economy principles, particularly in the areas of materials, structures, indoor environment and energy and water management. These areas will be supported by modern technologies in the field of digitization, optimization, modeling and efficient process management. The partners of the project are the Czech Technical University in Prague, the Technical University of Liberec, the Mendel University in Brno and 26 private sector companies. 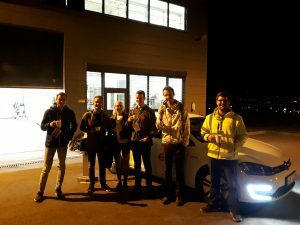 On October 22, 2018, a joint workshop was held with CEITEC representatives. 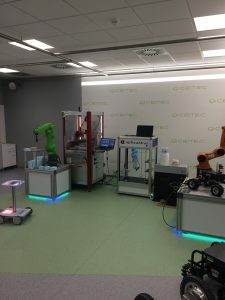 CEITEC researchers are preparing a testbed project for Průmysl 4.0. We believe that our geodesists and structural diagnostics experts will also be involved in the project as it will be necessary to determine the exact location of the machines and to solve the interaction of the machines with the building. Representatives of the AdMaS Center, headed by the Director and by Professor Kudrna, participated in the Road Conference in Ostrava from 17 to 18 October 2018, where they represented the research and the activities of the AdMaS Center and FAST as a whole. During the conference, the Czech Road Company awarded the FAST graduate, Ing. 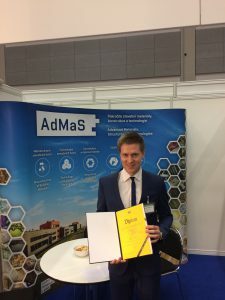 Pavel Coufalík, Ph.D., who obtained the diploma for the 1st place in the dissertation thesis 2018 for the Rheological properties of asphalt binders, for which the equipment of the AdMaS center was used. • Demonstration of mixing of asphalt mixtures, including the production of test ensembles (the manufactured test ensembles can be carried away by the visitors as a small souvenir item). • Can the asphalt surface absorb water? Practical demonstration of drainage carpet. • Fire tests for asphalt surfaces – video demonstrations. • Surface roughness of different road types – stop in time? • The effect of the color of clothing on the visibility of people at night? Examples of reflective horizontal marking. • Limit load bearing capacity of structural members. Visitors estimate the ultimate load-bearing capacity of the structural element of the given profile and the selected material in the bend under the boundary conditions of the plain bearing and the loading of two loads in the middle of the span. The real load capacity will be experimentally verified on the universal test machine, including tracking the violation of the selected model. • Games with the center of gravity of the bodies. Identify the correct center of gravity determination of regular and irregular shapes verified at vertical stroke. • Material disturbances from near. • How many building materials will it last? • Can you recognize building material? • Demonstration of devices and equipment for the examination of the properties of building materials. • A view of the objects around us – X-ray tomography seriously and unconsciously. • Light spells to display the structure of materials. • Devil is hiding in details – possibilities of electron microscopy. • Cloudy Cloud – A sample of laser scanning. • Panorama of ladybird or what LadyBug can do. • Unmanned aerial aircraft simulator; hard on the drill field on the battlefield! • Periodic minimum areas, bio-inspired geometry and other mechanically beneficial structures. • Demonstration of flammability of various building materials. • Fire resistance of structures – how to do it? Ing. Jakub Hodul took part in an internship at the University of Malta, Faculty of the Built Environment, under the Erasmus + program. The training was focused mainly on research and development of polymer-cement mortars with different content of crystallization additive in order to increase their long-term durability and impermeability to aggressive media. 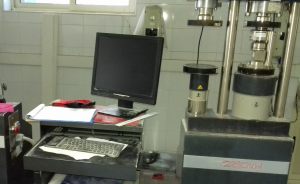 In the framework of research work, the basic physico-mechanical properties were determined. With sub-samples, further research will take place at the AdMaS Center. In particular, it will be a study of microstructure. 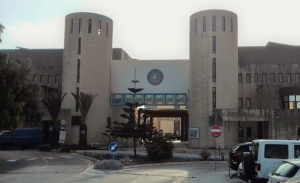 In the future, further cooperation with the University of Malta is expected, especially in the field of development and research, to increase the long-term durability of concrete, and also to use waste and secondary raw materials to improve environmental aspects. A story of the origin of sand in the unique wine cellars in New Saldorf was broadcasted in one of the tv sessions in channel CT 2, called Folklorika, on 29 September 2018 . According to the legend, the sand was collected and sent off to Vienna, where it was used to build houses. AdMaS researchers from RG1 surveyed this sand at the request of local winemakers and spoke in the program about their research. Representatives of the AdMaS Center, headed by the Director, JUDr. Ing. 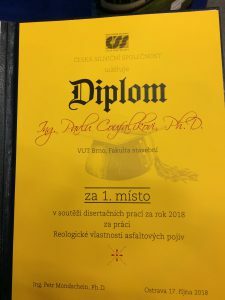 Zdeněk Dufek, Ph.D. and prof. Ing. Jan Kudrnou, CSc., will take part in the 26th Road Conference which will take place in Ostrava at the Clarion Congress Ostrava Hotel and at the Vitkovice Arena Athletic Hall on October 17 and 18, 2018. 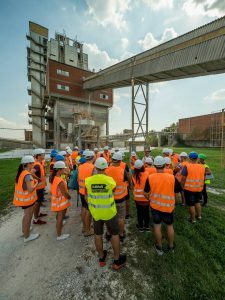 Researchers at the MSM Research Center, AdMaS, organized a foreign excursion to manufacturing plants and universities in Hungary and Serbia for students of the “M” field of the Faculty of Civil Engineering, Brno University of Technology. Two technical universities were visited within the framework of a foreign working trip, where both our own research and research projects and tasks were presented. The question of the cooperation of individual workplaces, including the possibility of working stays, was discussed. At the Technical and Economic University of Budapest (Budapesti Műszaki és Gazdaságtudományi Egyetem), the Faculty of Civil Engineering (Építőmérnöki Kar), the Department of Building Materials and Structures (Építőanyagok és Magasépítés Tanszék), we were, on the demand of the head of the department prof. Györgye L. Balázs, accompanied by Viktor Hlavicka (from the building materials department) and Balázs Nagy (from the Department of Building Physics) who showed us the building materials laboratories and presented their research tasks, the instrumentation and the methods used. 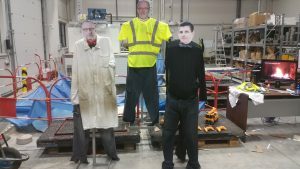 The possibility of collaboration between laboratories and the possibility of student placements was discussed. At the University of Belgrade, Faculty of Civil Engineering, Institute of Building Materials and Structures contact was made with Professor Dragan Budjevac, Dean of the Faculty of Civil Engineering Professor Branko S. Bozic, and Dimirija Zakić, Head of the Building Materials Testing Laboratory, with whom a preliminary visit was arranged at the Faculty of Civil Engineering in Brno and the AdMaS Center. In addition, the business trip focused on visits to the manufacturing plant of building materials. 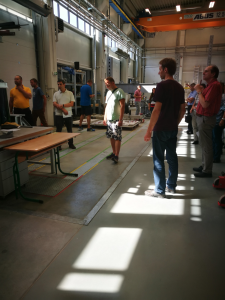 The individual participants were acquainted with specific production processes and subsequently negotiated possible cooperation with the Faculty of Civil Engineering on partial research tasks and technology innovations, especially in the framework of student projects and contractual research. 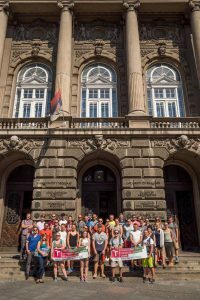 On 11 September 2018, the AdMaS Center welcomed participants of the Meeting of the Building Structures Institutes and the Departments of the Czech Republic and Slovakia (Prague – Brno – Ostrava – Bratislava – Žilina – Košice). 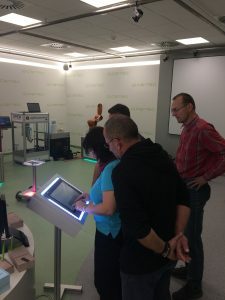 During a meeting organized by the Building Structures Institute at the Faculty of Civil Engineering, Brno University of Technology, colleagues from other universities took round of all the pavilions of the center and during a two-hour excursion they were acquainted with its equipment and current projects. 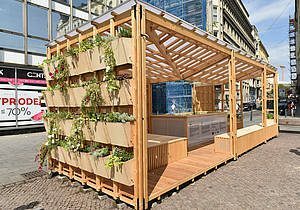 The AdMas Center, in cooperation with ConWe, s.r.o, took part in the implementation of the urban cell module, located in Malinovské square in Brno. The cell tests how to make good use of rainwater for cultivating a cooling green city. The prototype operator is the Public Greenery of the City of Brno and it costs the city about half a million crowns.